Libraries have experienced a rapid change of emphasis and importance in recent years. In Freiburg, this development has been accelerated by the spectacular new building for the university library. Digital channels play an important role in this process of transformation. It quickly turned out that it is not enough to give the website a new look and the technology a more responsive, contemporary structure. Relevant, easily understandable contents with a clear navigational structure support the transformation and offer more value for the users. As a 24/7 library, open seven days a week and around the clock, a good user experience is obligatory. The changes in the library’s role because of digitalization creates new challenges for the library staff. Tech installations must be self-explanatory, and the website must explain all important functions, even when the staff has gone home. We introduced Service Blueprints as a tool for interdepartmental and multi-channel analysis and planning of processes. This experience has increased the awareness of the many things in the organization that were dependent on other parts of the organization. At the same time, the knowledge that we attained about the processes has helped us to better integrate the individual communications channels. The goal is that the user, at every step, will be able to find information relevant to this area on an accessible channel. The structure seemed “odd” and “confusing” and “using it did not make it more accessible”. As in many other organizations, the structure of the website has, until now, more been based on the departmental organization than on optimizing the total process for the user. Qualitative interviews have made it clear that this structure was difficult for users to understand. Many users were frustrated and preferred to ask their questions in person rather than looking for information on the website. By doing so, they used a great deal of library staff time. With a fresh look from outside the organization, we have created a new navigational structure from the ground up. We reduced the structure to four levels and made sure that navigating the site was organized in such a way that it explicitly oriented itself toward the needs of the user. We tried out the navigational structure with several simple usability tests with users and refined it on the basis of the results. In this way, we were able to confirm that the new navigation structure truly is intuitive to use. Over time, the website of the library had grown to several thousand pages. We did a Content Audit that gave us an initial summary of the existing content. On the basis of this overview, we consolidated many pages and gave them new content with new structures, such as accordions. The contents are created by a team of very different authors. The university library has created a multimedial editorial team that coordinates the contents of the pages and certifies their quality. In a workshop, we developed a concept of how the authors wish to interact with users. Together with the copywriter Matthias Winkler, we practiced how the authors achieved the desired feeling with their style of writing and developed, on that basis, a short set of guidelines. We worked with the editorial team and the authors for many months. Gradually, we were able to rework the authors’ contents so that they now seem more of a piece and are easier to understand. With a completely renovated building, Freiburg now has the biggest and most modern university libraries of Europe. The library remains a place for concentrated reading and learning using many media types. Besides that, however, the parlatory, a room that is open to everyone and where it is permissible to laugh and to carry on lively conversations, has become more and more important. The new self-awareness of the Freiburg university library reflects a new corporate image that differentiates itself more from the university itself. Since the library’s opening in July 2015, the website shines with new brilliance. The digital dimension has been purified and simplified. For users, many sources of information are now easier to find and easier to understand. That reduces the number of questions for the library staff and makes it possible to handle the greatly increased number of visitors. Instead of having to answer banal questions, there is now more time to help students and other users with more difficult problems. We are proud that we have been able to breathe a stronger user orientation into the university library. With our start-up help, the editorial staff has since begun, on its own, to think more about things from the viewpoint of the user and is focussed on optimizing internal processes even more. 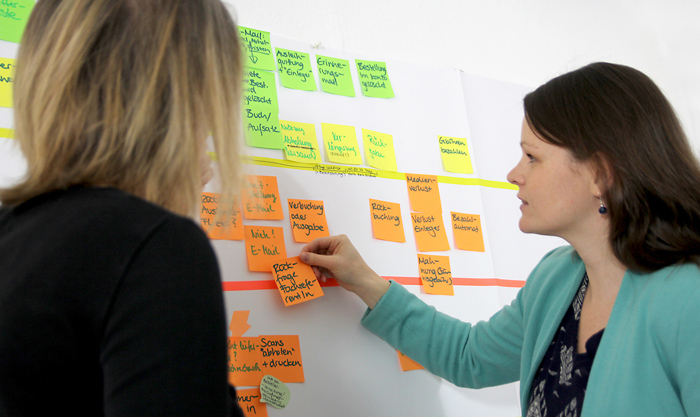 With the Service Design method and an interaction period of many months, it was possible to anchor the values of the new corporate design in the place where it is needed – in the daily processes.